It was 90 minutes into the Tonys when the show took its first obvious dig at President Trump. Remarking on James Earl Jones receiving a special Tony for Lifetime Achievement in the Theatre, host Kevin Spacey quoted a few of Jones' famous lines. "I am your father," Spacey said in a deep, Jones-esque voice, referencing his Jones' memorable turn as the voice of Darth Vader. And, Spacey added, "This is CNN, the most trusted name in fake news." Indeed, Jones is the voice of CNN's famous on-air slogan, "This is CNN," but the cable network does not refer to itself in promos as "fake news." Instead, that criticism is beloved by Trump, which has branded the network as "fake news" since his first press conference as president-elect. Spacey continued to go for the sharp digs when he reappeared later in the show dressed as Bill Clinton, showing off his impression of the former president. Spacey's Clinton began by saying, "we've had some surprising winners," before adding, "I'm not even talking about the Tony Awards," likely an allusion to his wife Hillary Clinton's expected win of the 2016 presidential election. Hillary continued to serve as a punchline as Spacey's Bill Clinton pointed out that Dear Evan Hansen star Ben Platt bumped Hillary off of Time magazine's "Most Influential" list, but he said she still topped the musical star in one area. "There's no doubt Hillary's better at creating fake email accounts than you," Spacey's Clinton said to Platt before observing, "I'm going to get in trouble when I get home." There were some subtle political comments earlier in the show from Cynthia Nixon, Sally Field and Kevin Kline, who praised the National Endowment for the Arts. Nixon, accepting her Tony for best featured actress in a play, turned political at the end of her speech. The actress said it was a "privilege" to appear in Lillian Hellman's "eerily prescient play at this specific moment in history." Nixon continued, "Eighty years ago, [Hellman] wrote, 'There are people who eat the earth and eat all the people on it and other people who just stand around and watch them do it.' My love, my gratitude and my undying respect go out to all of the people in 2017 who are refusing to just stand and watch them do it." Later, speaking about the American Theatre Wing, Sally Field said, "[the American story] reminds us of our strength in diversity, our common bonds and our enduring national spirit that has always guided us through adversity. Born in perilous times, the wing in its next century will do what it's always done, illuminate the darkness with the blazing truth of art." Jill Biden, who introduced a performance from Bandstand, received a standing ovation from the Tonys audience, which included her husband, former Vice President Joe Biden. But leave it to best revival of a musical presenter and Late Show host Stephen Colbert to really go after the current administration. 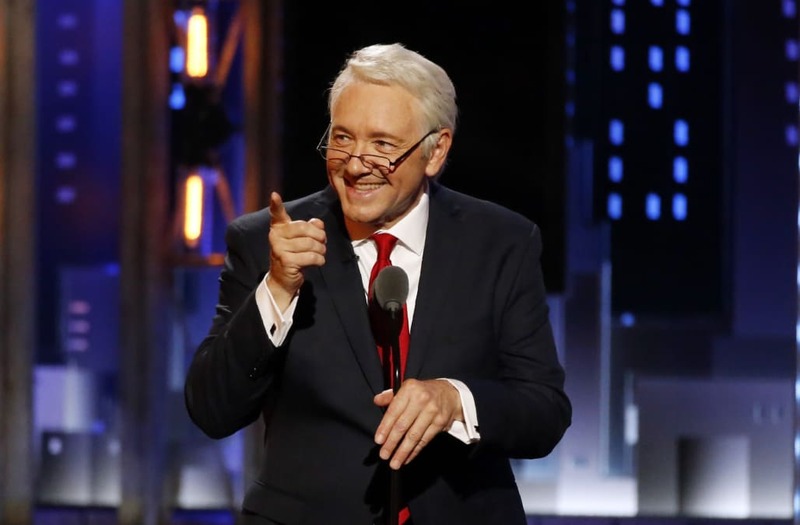 Colbert prefaced his introduction of this year's nominees by talking about another revival, down in Washington, of an off-Broadway show from the '80s that had massive production values. But, there are a couple problems with the show, Colbert said, "The main character is totally unbelievable and hair and makeup: Yeesh." "It's supposed to have a four-year run," Colbert added, "but reviews have not been kind. It could close early. Best of luck to everyone involved."